The Tradition is a very special watch in Breguet’s prestigious collection. The brand is renowned for their classic style and peerless heritage. The Tradition collection — which debuted in 2005 — epitomises these values while managing to look effortlessly modern. It’s quite a feat. 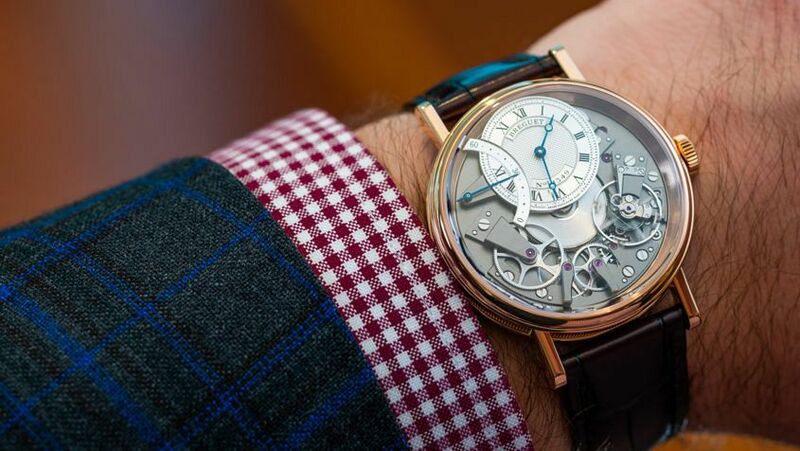 The traditional elements are easy to define — the engine-turned dial, the fluted case, the Breguet hands, that winding rotor. All details that speak directly to Breguet’s past. What makes the watch feel so modern is a little harder to define. There’s a few obvious tells, like the larger size and the use of silicon. And then there’s the harder to define bits, like the unconventional dial side movement and the modern looking (yet actually quite old school) peened finish on the bridges. Really though, it’s one of those whole-is-greater-than-the-sum-of-its-parts situations. Perhaps then, Breguet’s Tradition is like the best traditions — rooted in the past, yet flexible enough to move with modern times.